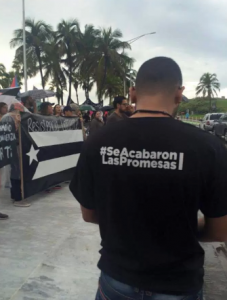 On May Day, 2017, CSSD’s Unpayable Debt working group launched its PRSyllabus, a resource to study Puerto Rico’s $70 billion debt crisis in the context of over one hundred years of colonial governance by the United States. “The syllabus comes at a critical time,” says working group co-director Frances Negrón-Muntaner, Professor of English and Comparative Literature, Center for the Study of Ethnicity and Race, Columbia University. Her point was confirmed when the syllabus attracted nearly 7,000 views on its first day. Created by working group members and collaborators Yarimar Bonilla, Marisol Lebrón, and Sarah Molinari, the syllabus provides a list of resources for teaching and learning. The syllabus’s goal is to contribute to the ongoing public dialogue and rising social activism regarding the debt crisis by providing historical and sociological tools with which to assess the crisis’s context and repercussions. PRSyllabus is the first in a series of three syllabi that the working group will release over the next year in relation to the damaging effects of debt on various locations around the world, including Detroit, Greece, and the Caribbean. The Puerto Rico syllabus can be accessed here.